Three native ingredients make this traditional Mexican salsa a delectable culinary heritage: tomato, chile and salt. Each provides important nutritional elements, and the combination is, well, fresh and delicious. There is much to be said for simplicity. 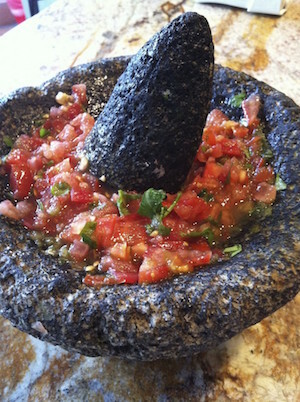 My mom, amá, made this salsa everyday, using a molcajete, the made-by-hand volcanic rock mortar that is a staple in every Texas Mexican family kitchen. You can use any other mortar and pestle, or even a spice grinder. This Serrano and tomato salsa is my favorite, fresh-tasting with green herbal notes. Our Texas Indian ancestors used the salt from two large salt lakes near Raymondville, “La Sal Vieja” and “La Sal Del Rey” (Coole, 2013). They used it in cooking and also traded it with their southern neighbors in what is now Mexico, even as far as central and southern Mexico. “Prehistoric trade in the lower Rio Grande region is evidenced by pottery shards found at occupation sites near Brownsville, which originated in the Huastec culture area on Mexico’s Gulf Coast near Vera Cruz” (Fort, 2011). 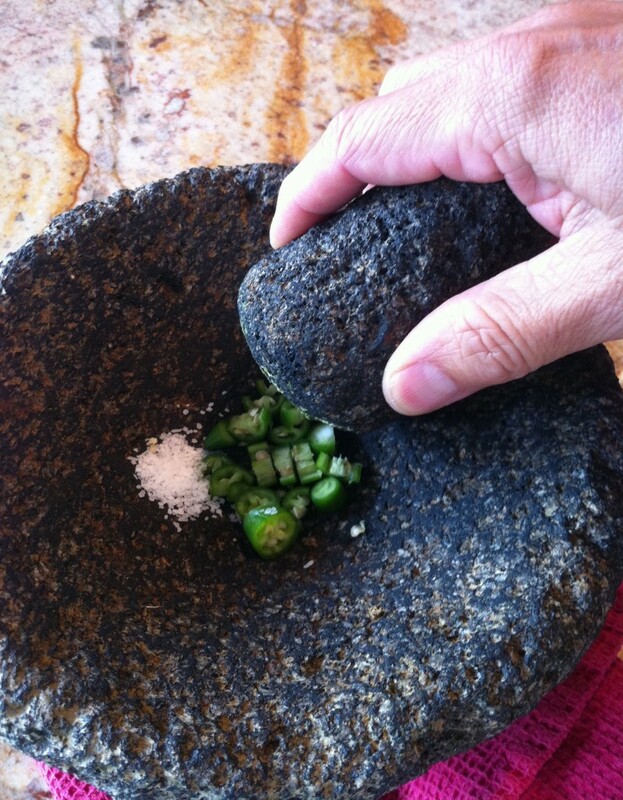 Place the salt and Serrano chile in a molcajete and grind until the chile is a paste but still has some green flecks. Add the tomato and mash together. We hardly ever added any, but if you have cilantro and like it, add it at the end. Beautifully flavorful and elegant, this salsa is a testament to the wisdom of using chiles for flavor, less because of heat. And to restraint. It emphasizes the importance of well executed balance and contrast. I know we like to and have to experiment, but try to steer away from overly confused concoctions. Leave me a comment and let me know if you agree. Ruth Musgrave Coole, “LA SAL VIEJA,” Handbook of Texas Online (http://www.tshaonline.org/handbook/online/articles/rol01), accessed September 21, 2013. Published by the Texas State Historical Association.